Ain't that the truth! 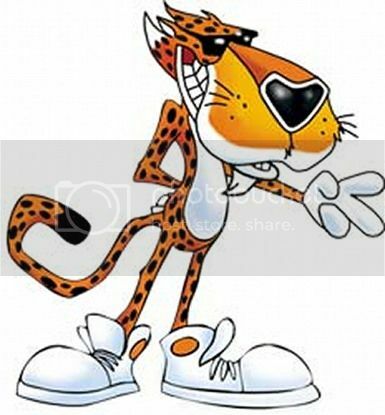 Today we're looking at the coolest mascot to grace the chip aisle, Chester Cheetah. Because information on the internet is totally apocryphal there are multiple origin stories for Chester's inception, but weather he came from an ingenious ad agency, or the mind of Hawley Pratt (creator of the Pink Panther) he has been entertaining us in Cheetos ads since the 80s. Chester is the epitome of cool. Sure he's cheesy, and honestly silly sometimes, but man is he also totally suave when he wants to be. I mean he's a cheetah in sneakers and sunglasses who just grooves along to his own beat all the time. How can you not love that?! Don't know what Cheetos are? well they're puffed corn snacks flavored with powdered cheese of course. They are totally addictive, and a good change up from chips. Here's a classic Chester ad. Get the picture now? So the gag with Chester is that yes he's a super cool dude, but he's also a bit crazy when it comes to Cheetos. Kind of in the way Sonny went Cuckoo over Coco Puffs, or the Trix Rabbit always lost it when he was about to eat some Trix cereal. Over the years he's varied in levels of silliness, but despite being portrayed as a bit of a buffoon sometimes, I think most people agree that this cat is pretty darn cool. Lets look at the snack for a second though. 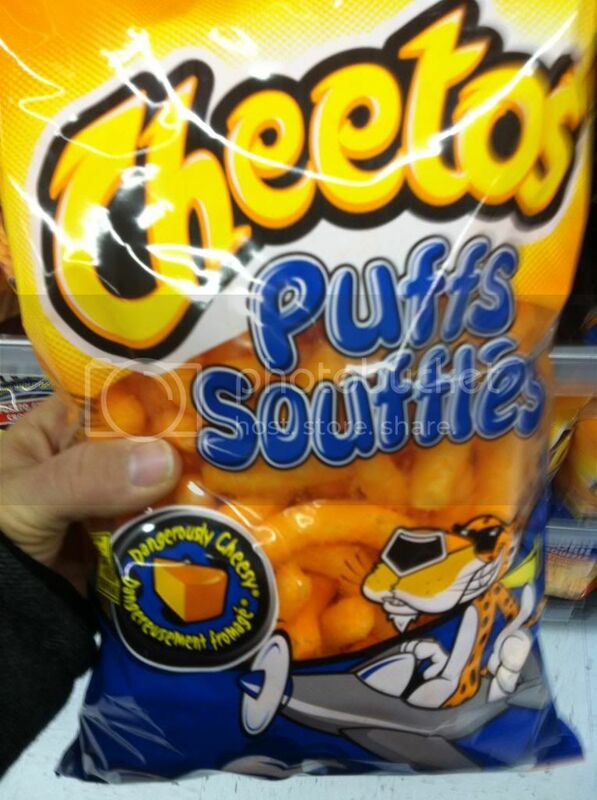 There have been a lot of different versions of Cheetos themselves over the years. And some of them are only available regionally. I know I was pretty disappointed when after recently moving from the States to Canada I realized that they don't seem to have either Flamin Hot Cheetos, or Honey BBQ Cheetos here :( This is the current lineup of Cheetos products that I can find easily in Canada. Cheetos Puffs are the classic puffed corn snack you know and love. 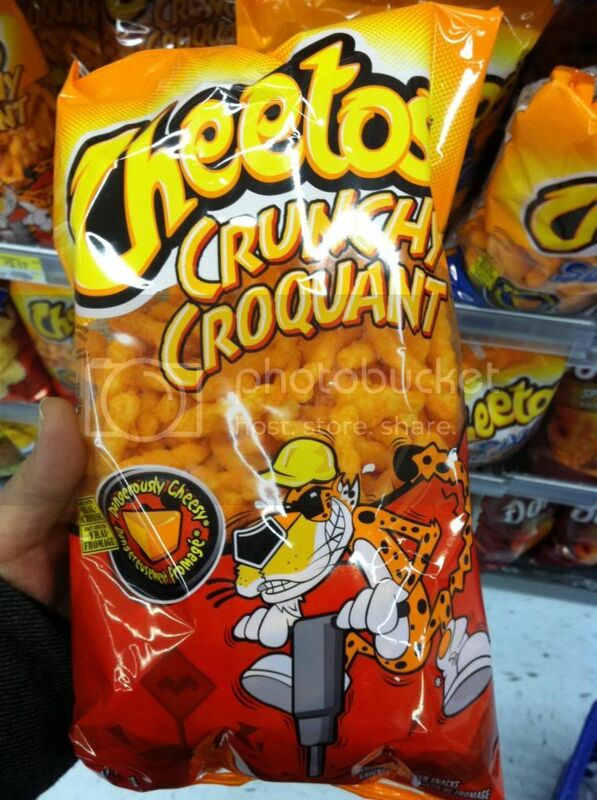 I expect these were the original Cheetos variety since I know I had these around since I was a really little kid. They are airy and light, and get cheese powder all over your fingers but man are they good. If you want a bit more heft though. Cheetos Crunchy are the best of the best. Not as classic as the Puffs but honestly they are fantastic, and I personally prefer them to the Puffs. These things are insanely addictive too and if you haven't had them in a while I definitely recommend you go get some immediately! Both the Puffs and the Crunchy varieties are the standards that you'll see everywhere. While there are and have been a number of other varieties over the years, here's what else I'm seeing currently on Canadian shelves. For the health conscious out there (I suppose..) they've got Baked Cheetos Crunchy. Now I've never had these before, but I expect they're alright. What I don't understand though is that if you're actually caring about whether its baked or fried you probably should just stop eating them... right? And Finally they've got this interesting variety that I wasn't familiar with before. 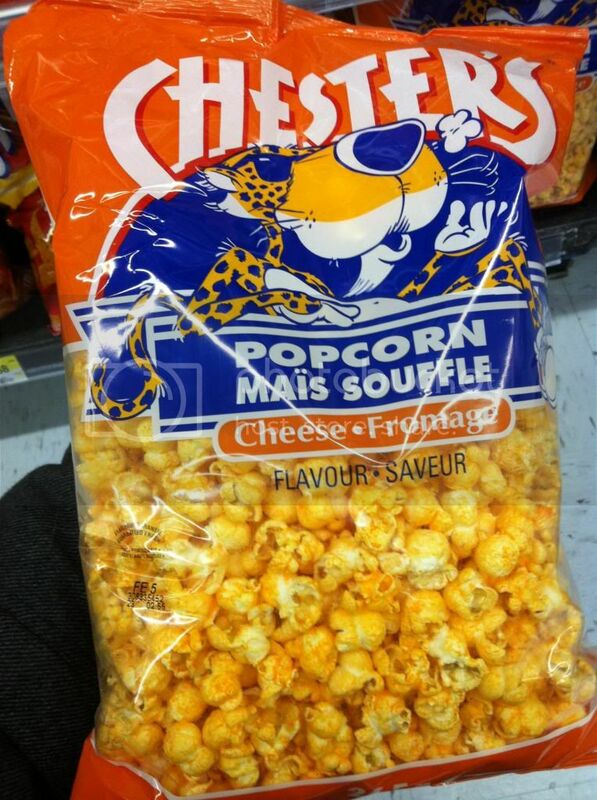 Cheese flavored popcorn is really a solid idea. 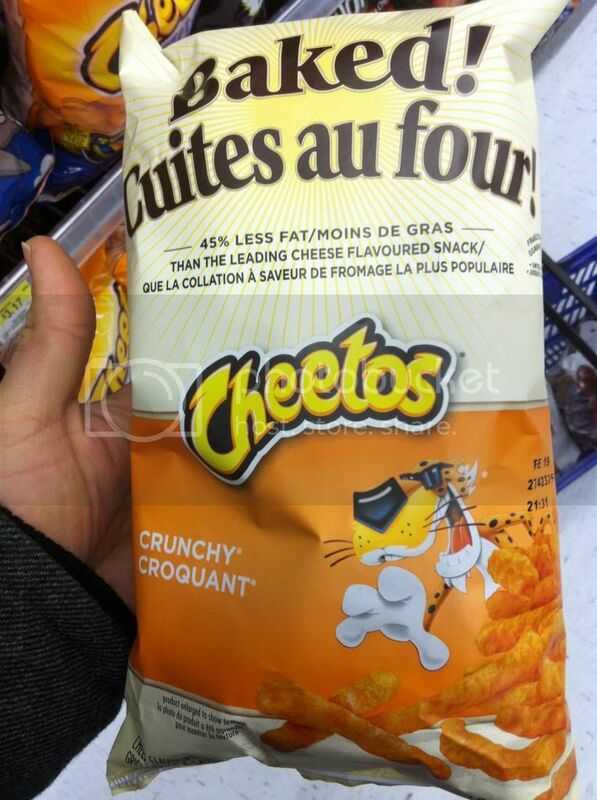 I know I've always enjoyed it when I've had it before but I wasn't aware that there was a Cheetos variety out there. This is one I'd like to check out. Back to Chester specifically though, the guy is always up to something. Even on the packaging I've shown you he's a pretty outlandish cartoon. 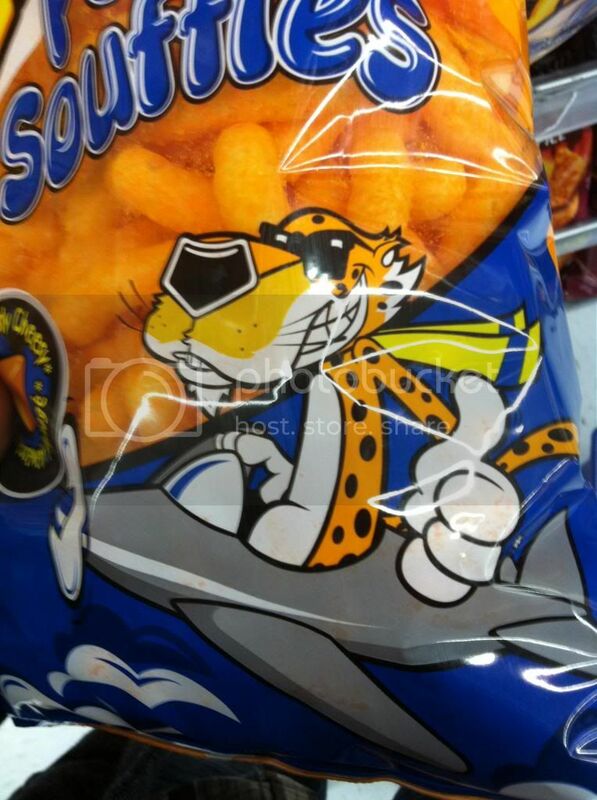 I'm not sure exactly what flying a plane has to do with Cheese Puffs, but I don';t care: I'm going with it. When they did a little revamping of Chester in the 90s they decided to start bringing him into the real world with some effects that honestly work very well. Kinda Space Jam-esque. Chester had a few more great adventures through the 90s as his popularity grew. And this is where they dropped a lot of the bumbling Chester in favor of a simpler and cooler Chester. You can see that he's a celebrity by '99 with the Daffy commercial. From here into the 2000s Chester became even more interesting, because while they still advertized to kids, with things like this OrangeUnderground campaign, they also started making ads that appealed to adults. The ads for adults started in the mid '00s and are more about skewing the status quo, bucking the system, and the little guy taking a small step to make their world a bit more bearable. Its a very 00s sort of mentality. Very Fight Club. And Chester has taken on the role of the devil on your shoulder, encouraging, and nudging. Its very subversive and I have to say I love it. Here's a classic ad that at least for me was the first time I was exposed to the beautiful Felicia Day. I have to say, this guy is pretty awesome. Sure a part of me wishes he still had a bit more of the fun loving 90s silliness, but I also like how much Chester is all about messing with the system. I mean who doesn't relate to this stuff? I know I skipped over his terrible video game and a few other little things, but that's ok. If you weren't familiar with Chester Cheetah before I sure hope you are now. The guy is legendary, and the snacks are great. I'm excited to see where Chester goes next. Chester Cheetah was created by Brad Morgan of DDB Needham, Chicago. without a doubt...remember the time..was not a PINK PANTHER TAKE OFF!..Kelly Holbert.